Section 1. Setting the Stage. G.F. Goodwin, C.S. Burke, J.L. 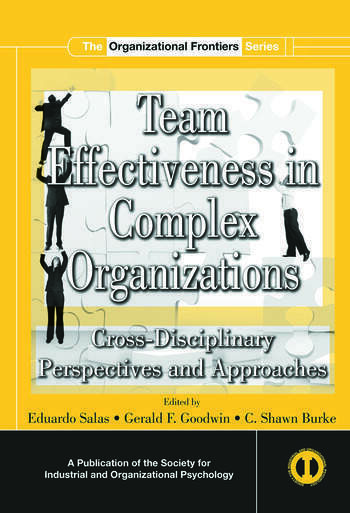 Wildman, E. Salas, Team Effectiveness in Complex Organizations: An Overview. R.L. Moreland, J.M. Levine, Building Bridges to Improve Theory and Research on Small Groups. E. Salas, M. Rosen, C.S. Burke, G.F. Goodwin, The Wisdom of Collectives in Organizations: An Update of the Teamwork Competencies. Section 2. Cross-Disciplinary Theoretical Perspectives. S. Zaccaro, B. Heinen, M. Shuffler, Team Leadership and Team Effectiveness. S.W.J. Kozlowski, D.J. Watola, J.M. Nowakowski, B.H. Kim, I.C. Botero, Developing Adaptive Teams: A Theory of Dynamic Team Leadership. N.J. Cooke, J.C. Gorman, L. Rowe, An Ecological Perspective on Team Cognition. A.C. Edmondson, K.S. Roloff, Overcoming Barriers to Collaboration: Psychological Safety and Learning in Diverse Teams. C.S. Burke, H.A. Priest, S. Wooten II, D. DiazGranados, E. Salas, Understanding the Cognitive Processes in Adaptive Multicultural Teams: A Framework. J.R. Rentsch, L.A. Delise, S. Hutchison, Cognitive Similarity Configurations in Teams: In Search of the Team MindMeld. L.A. DeChurch, J.E. Mathieu, Thinking in Terms of Multiteam Systems. P.J.M.D. Essens, A.L.W. Vogelaar, J.J.C. Mylle, C. Blendell, C. Paris, S.M. Halpin, J.V. Baranski, Team Effectiveness in Complex Settings: A Framework for Commanders. S. Mohammed, K. Hamilton, A. Lim, The Incorporation of Time in Team Research: Past, Current, and Future. Section 3. Measurement Tools. D. Dorsey, S. Russell, C. Keil, G. Campbell, W. Van Buskirk, P. Schuck, Measuring Teams in Action: Automated Performance Measurement and Feedback in Simulation-Based Training. K.J. Krokos, D. Baker, A. Alonso, R. Day, Assessing Team Processes in Complex Environments: Challenges in Transitioning Research to Practice. Section 4. Methodological Tools and Developments. P. Foltz, M.J. Martin, Automated Communication Analysis of Teams. A.J. Slaughter, J. Yu, L. Koehly, Social Network Analysis: Understanding the Role of Context in Small Groups and Organizations. W. Zachary, B. Bell, J. Ryder, Computational Representations and Methods for Modeling Teams. Section 5. Commentaries and a Summary: The Look Ahead. K. Smith-Jentsch, Measuring Team-Related Cognition: The Devil is in the Details. L. Weingart, M. Cronin, Teams Research in the 21st Century: A Case for Theory Consolidation. E. Salas, J.L. Wildman, Ten Critical Research Questions: The Need for New and Deeper Exploration. Eduardo Salas is University Trustee Chair and Pegasus Professor of Psychology at the University of Central Florida where he also holds an appointment as Program Director for the Human Systems Integration Research Department at the Institute for Simulation and Training. Before joining UCF, he was a senior research psychologist and Head of the Training Technology Development Branch of NAWC-TSD for 15 years. During this period, Dr. Salas served as a principal investigator for numerous R&D programs that focused on teamwork, team training, simulation-based training, decision-making under stress and performance assessment and measurement. Dr. Salas has co-authored over 300 journal articles & book chapters and has co-edited 19 books. His expertise includes assisting organizations in how to foster teamwork, design and implement team training strategies, facilitate training effectiveness, preventing human error, promote a culture of safety, and develop performance measurement tools. Dr. Salas is a Fellow of the American Psychological Association, the Human Factors and Ergonomics Society, the Association of Psychological Science and a recipient of the Meritorious Civil Service Award from the Department of the Navy. Jay Goodwin is a Research Psychologist at the U. S. Army Research Institute for Behavioral and Social Sciences. He received his M.S. and Ph.D. in Industrial/Organizational Psychology from Pennsylvania State University. Dr. Goodwin is currently a special projects officer in ARI's Strategic Initiatives Group, with responsibility for topics related to ARI's leader and organization research programs. He is also the ARI liaison for international, defense, and joint R&D. Dr. Goodwin's research expertise is in leadership, team effectiveness, and organizational issues in Joint, Interagency, and Multinational contexts. He was previously employed at the American Institutes for Research, where his project work included test development, employment litigation support with an emphasis on statistical analysis, training evaluation, and performance modeling. He is a member of the Society for Industrial and Organizational Psychology, the American Psychological Association (APA), and APA Division 19 (Military Psychology). He currently serves as an ad hoc reviewer for the Journal of Applied Psychology, Military Psychology and Human Performance, and is a member of the editorial board for Human Factors. C. Shawn Burke is a Research Scientist at the Institute for Simulation and Training of the University of Central Florida. Her expertise includes teams and their leadership, team adaptability, team training, measurement, evaluation, and team effectiveness. Dr. Burke has published over 60 journal articles and book chapters related to the above topics and has presented/had work accepted at over 100 peer-reviewed conferences. She is currently investigating team adaptability and its corresponding measurement, issues related to team leadership, multi-cultural team performance, multiteam systems, and the training of such teams. Dr. Burke is a member of the Society for Industrial and Organizational Psychology, American Psychological Association, and Academy of Management. She serves as an ad-hoc reviewer for Human Factors, Leadership Quarterly, Journal of Applied Psychology, Human Resource Management, Journal of Occupational and Organizational Psychology, and Quality and Safety in Healthcare. Dr. Burke earned her doctorate in Industrial/Organizational Psychology from George Mason University. "This volume will be a major synthesis of the new research and thinking on teams and thus update what is known in this important area. This volume will be an update of the Organizational Frontiers 1995 volume by Guzzo and Salas. The book has a number of strengths. One is the multidisciplinary theme of the proposed book. There are many theories, principles and tools that have emerged so a science of team effectiveness is now emerging. The book reflects this diversity and will allow the authors and editors to bring the theory and research from other disciplines to the attention of IO psychologists"